Tutorial-format guides to basic tools and features of Google SketchUp 7. Printable PDF format. Whether you're a new user or a SketchUp veteran, this book will help you design and model like a pro. Detailed, step-by-step exercises will guide you every step of the way, from the basic drawing and editing tools to groups and components, constraints and inferences, painting with colors and textures, working with Google Earth and the 3D Warehouse, and more. Want to go farther with Sketchup? 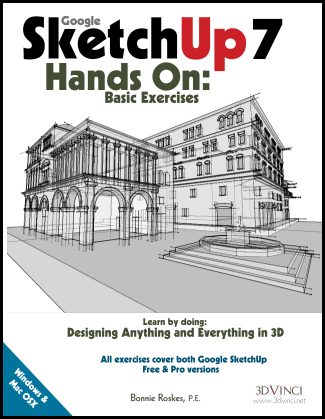 Check out our bundled set: Google SketchUp 7 Hands-On: Basic and Advanced Exercises. Buy the set and save! This PDF is ideal for on-screen viewing, and for dual-monitor systems. Because printing this book in color may be costly, you might prefer the printed version.